Do you love travel videos? Are you a travel vlogger looking to learn from the best? Here’s my list of travel vloggers on Facebook to follow in 2019. A must read a 16 step detailed guide on how my buddy Kris and I rode motorcycles from Cusco Peru to Machu Picchu! There is a lot to learn from Nas about travel vlogging and storytelling. It takes a mastery of both to be able to do so in 60 seconds – not to mention EVERY DAY! I love riddles, although I’m horrible at figuring them out. Here are my favorites to entertain your traveling friends with on your next 16 hour bus ride. This advice has saved travelers like you from experiencing yet another travel horror story. What advice do you have for other travelers? Meet Joe and Sharif, the founders of Tree Tribe – an outdoor lifestyle brand that plants 10 trees for every sale they make. A non-techie guide to using a VPN to access the web safely and enjoy your favorite US content on Netflix, Hulu, and Amazon Prime from anywhere in the world. Every American needs a valid passport, even if they don’t travel. Learn why you should get your passport today and read instructions on how to apply. Are you looking to grow your Pinterest following and build travel boards using the Tailwind App? Would you like to join travel related Tailwind Tribes? If so, check out the Best Travel Tailwind Tribe brought to you by TravelisLife.org. My goal is to be able to use my cell phone while I travel as much as I want without ever having to think about battery life. Here’s what I’ve learned. Have you reached the time limit on your free WiFi connection at the coffee shop? Learn how to bypass those pesky WiFi time restrictions by changing your laptop’s MAC address, a practice commonly referred to as “spoofing your MAC Address”. Read this article for instructions for both Windows 10 and Mac. Today I showcase a few random items that come in handy while I travel. These items have proven time and time again to be worth their weight in my bag. I love to negotiate. I believe everything is negotiable. Here’s how I save big money when I travel by negotiating with Airbnb, hotels, and retailers. Is jet lag real or in your head? Do you need free travel images to use on your travel blog or website? Me too. Here’s my curated list of the best free travel photography sites. A valuable resource for travel bloggers everywhere. Learn exactly how I created Travel is Life and all the tools, software, services, and tricks of the trade I use to create this website. 1500+ of the Best Travel Hashtags for Instagram. A one-of-a-kind marketing resource for bloggers, brands, and influencers. 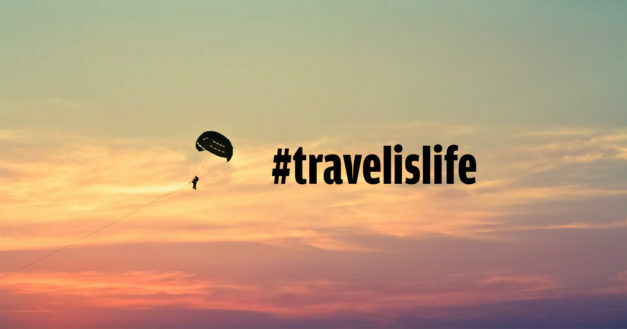 Brought to you by Travel is Life. Which travel apps can I use offline when I don’t have Internet? Let’s face it, you’re not always going to buy a local SIM card or find WiFi everywhere you go. These apps will make traveling while offline a little easier.